Prayer is a borderline necessary skill, used in various ways from questing to grinding monsters and so on and is trained via burying bones that drop from monsters or using a mechanic called the Ectofuntus. Prayer is exceptionally useful because of the three protection prayers that block 100% of the damage that an NPC can deal to you (50% in PvP), the minimum level required to use all three of them is 43. However, should you choose to level it up past that, you will find your prayers will last you for much, much longer and that your Prayer potions/super restores will be more efficient in restoring your points. Therefore leveling Prayer is always a good option, save for a bit of diminishing returns around level 90 or so. Another tactic to keep in mind is Prayer Flicking. This is simply switching on one of the three Protection Prayers for just enough time (one game tick, or 0.6 second interval) that the next incoming attack will be protected against, and then switching it off again to save your prayer points due to the fact that your Prayer Points are only drained while a Prayer is activated for a certain amount of time. This is useful in order to conserve Prayer Potion/Super Restore doses during times when it really matters like in Barrows or the Fight Caves. Try and practice Prayer Flicking on a low-risk enemy like any Guard first before you attempt the more dangerous activities like Barrows or PvP. You can also flick offensive prayers such as Eagle Eye/Mystic Might/Ultimate Strength/Piety/Chivalry for the extra damage without any of the drain rate either, which is incredibly useful for tougher monsters or PvP. Unlike every other stat that drains, Prayer points do not recharge over time. Instead, you must drink a Prayer potion/Super Restore potion or pray at any Altar located in most major cities (Lumbridge's is usually easiest) to recharge your points. Obviously, without any Prayer points, you cannot activate your Prayers. There are several different kind of prayers to use. Each prayer has a required skill level before it can be used, and once activated will drain your current prayer points by various amounts. 1 MUST be activated before death, it is not automatic. Because of its slow drain rate, simply activate it if you feel like you're going to perish soon rather than attempting to flick it. Prayer Gear, that is, equipped items that gives Prayer bonuses, will slow down the drain rate on your prayers - each point of Prayer bonus slows the drain rate of active prayers by 3.33%. This means that a +30 Prayer bonus will make Prayers last 100% longer, or twice as long from normal. Therefore, it is incredibly useful in combat situations to throw a few pieces of gear with Prayer bonuses on them into your setup for max efficiency. 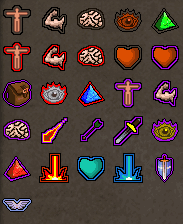 You'll notice that prayer bonuses are showcased in the Barrows and Fight Caves pages' equipment setups for this very reason. There are other pieces of general gear that offer Prayer bonuses (such as all maces, including Verac's Flail and the Void Knight Mace), but this chart mostly only shows gear specific to Prayer or best-in-slot pieces. Note that the Ancient Staff is uniquely the only item in the game that gives a negative Prayer bonus, of -1, AKA a 3.33% faster drain rate on Prayers. This is pretty negligible, but just so you know. Trimmed Skillcapes also give a +4 Prayer Bonus which is best-in-slot, but the untrimmed variants do not. Most Prayer gear is from Treasure Trails or found as loot. 1 The other God Books from HftD grant a +5 Prayer Bonus, even before they're filled with pages and grant other stat bonuses, but the Unholy/Zamorak book is best-in-slot due to its offensive bonuses. 2 All Broodoo Shields share the same stats, only their special bonus effect is different depending on the color. Charge of the shield also does not affect stats of the shields. Most small monsters drop normal Bones. There are some monsters that do not drop any bones, however. Some examples include: Spiders, Scorpions, Animated Axes, Earth Warriors, Demons, Ghosts, Otherworldly Beings, Imps, Ice Warriors and some quest monsters. Normal bones are near-useless if you intend to seriously level up your Prayer with only 10.125 exp per bury, but it's okay to bury them if you happen to be killing monsters that drop them for a little boost. These bones only drop off wolves, found around White Mountain (Level 25 and Level 31), in the Al Kharid desert (Level 27), in the deep Wilderness (Level 64), in the Khazard battlefield (Level 64), near Rellekka (Level 64) and within the Tree Gnome Village Maze (Level 64), among other locations. They grant the same experience as normal bones, so you shouldn't hunt for them specifically if you want to level Prayer and nobody has much reason to kill wolves anyway. These bones can be picked up in the Greater Demon hut in level 46 Wilderness. Aside from having a higher average crime rate, these bones are identical to normal white ones in every way except that they're much more difficult to acquire - don't bother with them just like regular bones. These bones drop off various types of monkeys found on either Karamja or Ape Atoll. They only give 1 more exp per bury over normal bones, so don't bother with them for training. These bones only drop off level 27 bats. Bats can be found in Taverley Dungeon, outside Keep LeFaye, inside the Legend's Guild Dungeon, near the Coal Truck area behind Seer's Village and in several other underground caverns. They grant 2.2 more exp per bury than normal bones, so they're pretty much just as useless as them. These bones drop off most Giants (Hill, Moss, Fire) and Ogres. These monsters can be found in Edgeville Dungeon (Level 28), the Tree Gnome Village Maze (Level 28), Varrock Sewers (Level 40), the Wilderness (Level 40/Level 86), Karamja Jungle (Level 53), White Wolf Mountain (Level 54), and inside the Waterfall Dungeon (Level 86) among other locations. Big Bones give 33.75 exp per bury, over 3x the exp as normal bones, so they will definitely add up in the long run if you're slaying a lot of Giants. Using them with the Ectofuntus is a waste of time though. These bones drop off Baby Dragons. Baby dragons can be found in Taverley Dungeon (Level 48), Karamja Dungeon (Level 65) and within the Zanaris Evil Chicken Lair (Level 83). This is the last tier of bone that you should bury if you get any, as 67.5 exp per bone won't amount to much at the Ectofuntus and even then slaying baby dragons isn't very profitable. These bones drop from level 140 Skeletal Wyverns, found exclusively in the Asgarnia Ice Dungeon. They require 72 Slayer to kill compared to ZERO(0) for chromatic Dragons, and their bones don't even give as much exp as dragon ones (112.5 vs 162 when burying, 450 vs 648 when Ectoing). Avoid them at all costs, at least for training Prayer. These bones drop off Chromatic and Metal Dragons. Different types of dragons can be found in the Wilderness (Level 79/Level 152/Level 227/Level 279), Taverley Dungeon (Level 111), Hero's Guild basement (Level 111), the Ogre cave (Level 111), and Karamja Dungeon (Level 131/Level 189/Level 246). They give 162 exp per bury, but you should NEVER bury them as they are much more useful when Ecto'd, which becomes pretty much the best method to train Prayer. These bones drop exclusively from the Dagannoth Kings bosses found on Waterbirth Island. Rex, Prime, and Supreme, all level 303, are challenging bosses whom usually require group efforts to rack up a lot of kills on. Dag bones give 281.25 exp per bury and a whopping 1,125 per Ecto, but due to the difficulty of acquiring them they should obviously not be relied on for training. Treat them only as small boosts if you've done a few DKs runs or bought them from another player. There are four varieties of Zogre bones, accessible only once you have started the Zogre Flesh Eaters quest. These bones are obtained by killing the zombie and Skeleton Ogres, picklocking coffins (requires Level 20 Thieving) or using a key on the coffins. The three best varieties are only available through the coffins. The latter 2 tiers of variety should be Ectoed, as those grant even more experience than dragon and dag bones but are much slower to obtain and therefore not as good for longterm training rates. Ghasts are a unique monster that do not drop bones, but simply give Prayer experience when killed. Found in the Mort Myre Swamp just south of Canifis, you must have completed the Nature Spirit quest, be wielding a Silver sickle(b) and have a filled Druid pouch before you can attack a Ghast. Once you are near one, the Ghast will attack you, using up one of the items within the Druid pouch when it will then become attackable. Killing a Ghast grants 67.5 Prayer exp. This is the best way to get the most Prayer experience from your bones (4x the burying exp) and therefore arguably the fastest way to level up Prayer. Accessing the Ectofuntus mechanic simply requires the ability to access Morytania (64 Agility or Priest in Peril completed), but it is essential to complete Ghosts Ahoy for the Ectophial and also to get 53 Agility for access to a shortcut during repeated Ecto runs to make the whole thing faster. You'll also need 13 pots and buckets, and a load of teleport jewelry such as Rings of Dueling or Games Necklaces. Obviously you'll need a ton of bones to use up too. Due to the ease of gathering:experience rate ratio, Dragon Bones are the best (and pretty much only) way to go when it comes to the Ecto. Travel to the Ectofuntus (presumably with the Ectophial) with 27 bones filling up the rest of your inventory. Go upstairs and then Right-click -> Use a bone on the Loader, then load in all 27 of them. Teleport using either a Games Necklace to Pest Control, or a Ring of Dueling to Castle Wars. Bank and withdraw 27 more bones. Ectophial back to the Ectofuntus and repeat the process until you've loaded in around ~1,000 bones (or your entire stack if you wish, it doesn't really matter, may simply be more preferable to manage smaller stacks at once as you can only load in+ecto around 1,000 bones per day). You can check to see how many bones you have loaded by right-clicking on the Bone Grinder handle and selecting Status. Don't worry about leaving the bones in the grinder, they won't disappear ever - even upon logging out. Go bank again and withdraw 13 buckets and 13 pots, then get back to the Ectofuntus. Right-click -> Grind on the Bone Grinder to grind everything you've loaded in into bone dust. Click on the tray on the other end of the Grinder to automatically Fill your 13 pots up. Run downstairs and then go down into the trapdoor. Click on the broken railing right in front of you to hop down to the next level, go down the stairs right in front of you again, then run around to the other set of stairs leading down to the pool. Right-click -> Use a bucket on the slime pool to fill your 13 buckets with Ectoplasm. Return to the main floor quickly via the Ectophial. Now left click repeatedly on the Ectofuntus to worship it. You can only worship it a total of 12 times and then the Ectofuntus will be full of power - you must talk to one of the Ghost Disciples to claim your Ectotokens (5 per bone) and then worship it once more to completely empty your pots and buckets. Go back upstairs and repeat the process. The 13 buckets/pots in the inventory adds up to 26 items, plus the Ectophial is 27, so the remaining empty slot is taken up by the Ectotoken stack from here on out. Construction presents another method to train prayer in the form of Altars and Incense burners in Player Owned Houses where bones may be offered for higher experience rates than burying. The best altar available, Gilded Altar provides a 2.5x prayer experience bonus when bones are used on it plus an additional .5x per incense burner lit (for a total of 3.5x the burying exp). Lighting an incense burner requires 1 Marentill and for a tinderbox to be present in the players inventory. The Gilded Altar requires 75 Construction to build, and as a result requires around 3 million gp as a low minimum input cost. This does not necessarily rule out the possibility of poorer, lazier or less intelligent players stealing the sweat off the brow of the hard working however as house parties are possible. Alternatively the options of cajoling, bribery or insipid, pitiable, genuine friendship still exist. For a more direct comparison an optimal 13/13 method Ectofuntus trip (not including bone loading) takes roughly 2 minutes to pray 13 bones. An optimal Method 2 House Altar trip takes roughly 1 minutes 30 seconds and . Without considering bone grinding it's roughly 8 hours and 3065 Dragon Bones for level 80 prayer (2m xp in other words) at Ecto or 4 hours and 3502 Dragon Bones for Method 2 at Gilded Altar (6 hours for Method 1) at respective optimal speeds. You should be able to earn 500 dbones worth of cash in 4 hours. With that in consideration the 2-5m cost of 72/75 construction and time involved there should be your only concern. Set your house portal to Yanille. Withdraw 2 marrentill, a tinderbox and 25 bones from Yanille bank. Enter your House, light your burners and use your bones on your Altar. Withdraw 2 marrentill, a tinderbox, 22-24 bones and runes/tabs for Teleport to House. Teleport to your House, light your burners and use your bones on your Altar. Teleport using either a Games Necklace to Pest Control, or a Ring of Dueling to Castle Wars. Set your house portal to Rimmington. Withdraw most of your bones and marrentill in note form. Withdraw un-noted your tinderbox, 2 marrentill, an inventory of bones and a reasonable amount of gp. Travel to your house, light your burners and use your bones on your Altar . Sell 2 marrentill and buy it back, sell your bones and buy them back. Use sell x for best effect. Hope very hard that the store doesn't remove stock. This method is unsuitable for expensive bones for this reason. For all methods the timing on the follow up 'use bone on altar' click is as the bones in the overhead animation disappear. From the start, do The Restless Ghost. It is a very easy quest that will grant 2,531 Prayer XP, which will get you to level 15 from level 1. Next, do Priest in Peril. This quest will give 3,163 Prayer XP, bringing your level up to 22. Ghosts Ahoy will be your next quest. Completion of this quest will give you 5,400 Prayer XP, which should bring you up to level 28. Note that these quests are not the fastest way to level up from 1 to 43 or whenever, but they're all required for Ectoing later on and so they should be done early to get them out of the way. Quest exp rewards are most efficient at lower levels too, so it's a win-win. Click the guide links if you need help in any of them. After the completion of Goys Ahoy, worshiping the Ectofuntus with dragon bones is the cheaper way to level. Each dragon bone used on the Ectofuntus will give you 648 experience. It will take approximately 3,050 dragon bones to reach level 80 at Ecto, or approximately 20,100 dragon bones to reach level 99. Read the relevant section for the most efficient Ectoing method. Alternatively if you're a good goy who gave the Jewmill 2m for 75 construction it will take approximately 3500 dragon bones to reach level 80 at a Gilded Altar, or approximately 22,980 (what savings!) dragon bones to reach level 99. Read the above section for the most efficient Altar methods. Note that if you just wish to get to level 43 for the Protection Prayers, ectoing about 61 dragon bones is enough to get you there from level 28. How can one feasibly get this many dragon bones, you ask? Slaying dragons for their bones is the most cost-effective way, as buying dragon bones from other players is expensive but still a plausible method. Ranging dragons via safespotting is even better and cheaper. At this point you should be swapping from ecto to Gilded Altars for your dbones as it's 22 hours of optimal grind vs 44 hours optimal at Ecto assuming dragon bones all the way. If you're tired of Ectoing dragon bones or you simply don't have enough, from level 80 onwards it is also possible to dump points from Pest Control into your Prayer XP. This is just as fast or faster than Ectoing dragon bones if you can get consistent games. However, be prepared to play a lot of games, as you will need several thousand points to bring this skill to 99. Click the minigame guide link if you need help learning how to play. You don't have to purely Ecto or PC to 99, doing a bit of both is what's most recommended to get there the fastest. Prayer is a moderately difficult skill that can be elevated into easy status by those patient enough to gather ~20k+ Dragon Bones, those rich enough to purchase ~20k+ Dragon Bones, or just any schmuck that knows how to play Pest Control. The benefits of higher levels of the skill are well worth it either way, so good luck. Why use Pest Control points from Level 80? Why not earlier? At around level 80 and above is when PC points give the best point:exp ratio. Using them before this is usually considered a waste.